It's only in Michigan that one can experience a taste of all four seasons: spring, summer, fall and back to winter, all within the time period of one week, as we did in January, with heavy snow... thaw... high temperatures... then sub-zero temperatures. Then a week later the groundhog foretold that spring is only weeks away. Wow! It was good to see so many of our own chapter members at the February 11th "White Shirt Day" celebration to honor and commemorate the original Sit-down strikers. They led the way for us to have many of the benefits we now enjoy, even though those benefits are still under attack today. The VEBA trust representatives will be at our meeting, on March 19, to update us again on the insurance programs in 2019. If you would like to attend this year's session at Black Lake, May 28-31, we must have your name submitted by March 1. So, stop in the office and get the application filled out ASAP. May 22, will be Senior Power Day at Crossroads Village. Welcome to 2019, and I hope you haven't written 2018 on your checks or correspondence too many times so far. Some things you may want to add to your calendar this year include: Sam Duncan Bingo at our Local on April 16, the annual Senior Power Day at Crossroads Village, and the week at Black Lake, which will be May 28-31. We have plenty of slots for you to attend. Starting in 2019, there will be a 3-year "No repeat" policy in attending Black Lake. We have registration and instruction forms in the office for all who are interested in attending this year. Please make your desires known ASAP as we have a March 1, 2019 deadline for submitting names of those wishing to attend the May 28-31, 2019 session. Two bills have been introduced in Lansing concerning you. One is to repeal the right-to-work law, and the other is to eliminate the tax on pensions that was recently passed. Call, write, and visit your representatives to tell them your feelings on these bills. Collectively (given enough time), we could list hundreds more uses and abuses. Yet, even with all our technical, mechanical, electrical, electronic knowledge, and devices we cannot keep 100% accurate track of time. Even the atomic clock that we base our time on must be adjusted occasionally to compensate for its lack of accuracy. May we use our time wisely in this time of life to work toward a better society, government, schools, relationships, for the well-being of our children and grandchildren. Keep in touch with all of your representatives in government and help them understand our needs and wants for a better world. Hope your Christmas is filled with joy and happiness. Get your resolutions ready for next year. No Bingo the first Tuesday of January, but our regular meeting will be the third Tuesday (15th) at 10:30 am, as usual. Our 11th year and counting. The Local 659 Retiree Women's Committee held their Annual Thanksgiving Foodbox Giveaway on November 19, at UAW Local 659. The giveaway provides area low-income families who have children with a complete Thanksgiving dinner; an eight to ten pound turkey with all the fixings and dessert. Three Flint Schools provided names of families in need and, on the day of the giveaway, families came and picked up their box with I.D. One hundred and twenty boxes were handed out this year. One family received a $25 gas card, which was donated by Local 659 President Steve Gruener. The Women's Committee raises money throughout the year and the 659 Executive Board and Retiree Executive Board also make donations to make the giveaway a success. A number of people also make individual donations and a big thank you to the Joint Council for their canned food drive. Region 1-D Standing Committee Conference was held at Traverse City Resort on October 26-28. The conference had a number of informational workshops, as well as great speakers. Author, motivational speaker and personal trainer Major Franz Whitman spoke to attendees. His motto is "the best is yet to come." Also speaking ws U.S. Senator Gary Peters of Michigan. This year's charities, Brave Heart Estates (Operation Injured Soldiers) and Great Lakes Burn Camp for the Children, received $2,000 in donations from the conference. Congratulations Region 1-D for another great Standing Committee Conference. With the mid-term elections over, except for the recounts and challenges, it's time to get to work encouraging our newly elected representatives to do what they were elected to do. We will have Bingo on the first Tuesday in December, at 10:.30 am, but no meeting on the third Tuesday. 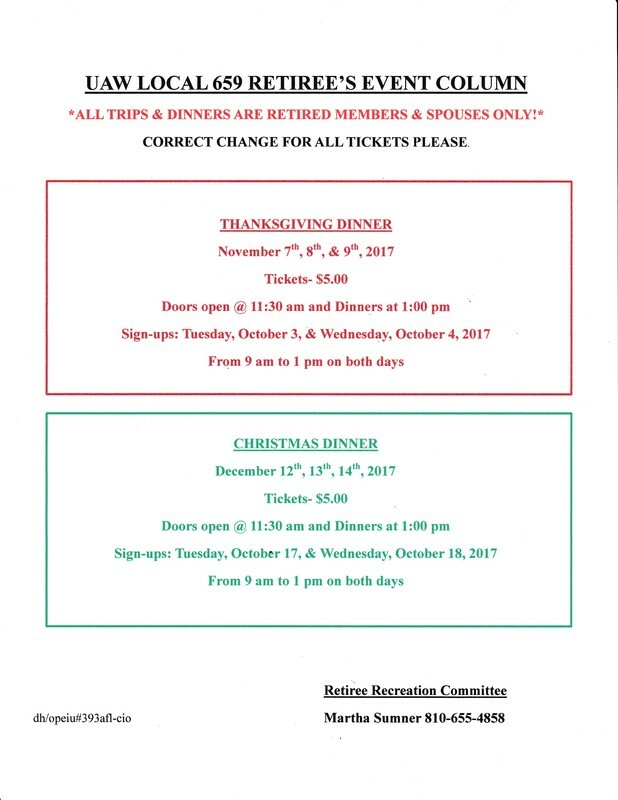 I hope you bought your ticket for our Christmas Dinners on December 11th, 12th, and 13th. Doors will open at 11:30 am with dinner at 1:00 pm. I'm sure glad Christmas is on the 25th of December this year, and New Year Day falls on the 1st of January.... What a relief! What a wonderful time of year to walk outdoors and see the trees in their full bloom of fall colors. The "leaves" at this time of year are beautiful to see, as they glisten in the morning, afternoon, and evening sun. Then it happens, they continue to ripen and turn their ugly brown, then "leave" the tree to fall to the ground where they are blown about. They pile up in hard to get at corners, under porches, and in bushes. They will lay there and rot if not raked, bagged and sent to the trash or burned. One does not even need to see the smoke from burning "leaves" to know someone in the neighborhood has a fire going. This signals the change of seasons from summer to fall and leading to winter. What a maddening time of year to turn on the television and see the political ads in their full force of constantly tearing down an opponent to possibly gain an advantage in a race for elected office. Sometimes I wish they would just "leave." The mail is even full of "leaf-lets" promoting someone, or something we need to vote for, or against. It'll all be over, as the mid-term elections come and go. Maybe they will "leave" us alone... probably not! Have you ever been attacked by a swarm of bees? One comes at you then suddenly there are seemingly hundreds swarming around. I'm trying to eliminate a bee's nest in a hard to get rid of location at my house. I hung a glue board, "Sticky trap," at the opening where they were entering and leaving the nest. It appears that when one lands on it and he feels endangered he sends a signal to the others for reinforcements to help. Soon the glue board is completely covered in bees stinging, but unable to free themselves. I replaced the board at least 4 times and then sealed the opening, eliminating the threat. We, as citizens, need to adopt this type of action for the upcoming mid-term elections. Send out signals to our family members, friends, and neighbors that we are under attack by now in control legislators. We need help to elect ones that are labor and working-class friendly. By the way, the bill they just passed to increase the minimum wage to $12.00/hour was passed just to keep it off the ballot this fall. By doing that, they can amend and change the bill by a simple majority of votes. Otherwise, it would have required at least a 2/3 majority. Let's change the majority in the fall elections. Just a reminder, Bingo is the first Tuesday of the month at 10:30 am, and our regular business meeting is the third Tuesday of the month at 10:00 am. See you soon! 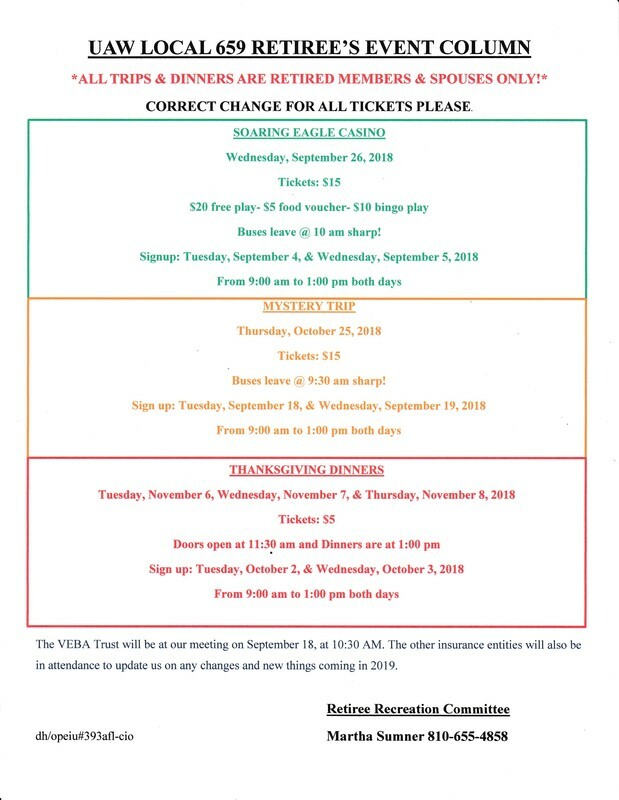 The VEBA Trust will once again be at our meeting September 18, at the regular start time of 10:30 am. The other insurance entities will also be in attendance to update us on any changes and new things coming in 2019. Mark your calendars to be at this meeting. While laying on a lounge outside to watch the meteor shower tonight, (August 12), which was supposed to be the best night, I realized (again) how big the universe is, and how small we are in comparison. I did see several meteors, which were quite impressive. Each one only lasted a split second before it disappeared forever. Just a thought, we only live a few years here on earth in comparison to the age of the world, our nation, and civilization as we know it. I hope we can affect some changes to society, government, other lives, which will endure to all future generations - our children, grandchildren, great grandchildren, etc. Hope you are enjoying this hot weather that we wanted, and said we wouldn't complain about when it was cold last winter. Consider this for a moment... Andrew Carnegie, JP Morgan, JD Rockefeller. They were three of the richest men in the world at the turn of the Century (1900s). According to historians, they were responsible for getting William McKinley elected in November 1986, as the 25th President of the United States. Now, because he was their President, he was responsible for the rollback of many environmental regulations and he was lenient on the "monopolies" they enjoyed in the railroad, steel, and oil industries. This policy continued until his assassination in September 1901, when VP Theodore Roosevelt took office and soon there was action to break up monopolies, and anti-trust suits were filed. Remind you of anything? Today, we have the Koch Brothers, who alone spent close to $900 million in the 2016 elections. Along with the super PACs and other untraceable monies, they elected D.Trump as President of the United States. Since then, we've already seen the rollbacks of EPA and OSHA regulations, along with many other executive order changes. Be prepared to VOTE, and vote responsibly in August and November. Enjoy the heat of summer and fellowship with family this summer vacation. Where do you get your news? It depends on what you want to hear. Do you want to hear how good Trump is, or what great things he accomplished lately? Do you want to hear how badly he's treated by the media and how terrible the Democrats have messed up everything he must fixed, or repeal? If so, you're listening to FOX news. Do you want to see and hear things that will make you mad or get you madder about how Trump is trying to stop or impede the investigation into Russian meddling in our democracy and democratic way of life, our elections, and generally trying to sway public opinion about many of our tried and true ways of living? If so, watch MSNBC or CNN. With smartphones that record video and sound, people are all over the place, taking videos of every type of confrontation, and sometimes human interest stories. Facebook has given rise to any kind of news, if you want to call it that - people confronting people, to police arresting and beating people, who of course, maintain they were innocently "just there." You need to be careful what you say or do, because someone just may be there with a smartphone recording it all, and then you'll be on the news. I've found one of the best sources for down-to-earth reporting on both sides of an issue is PBR. Public Broadcast Radio doesn't have the money of the huge networks, but they do have reporters all over the world reporting in the most unbiased way we are accustomed. It's radio, but real news. Hope you don't all get your news from one source and are able to average it out and be able to form responsible and level-headed opinions about the world around us. Remember, there will be no Bingo or Meetings in July or August. Generally speaking, we have witnessed the decline of the size and power of unions; even the solidarity of people standing together for what is right and best. In our state alone, we've had a Republican governor for 20 of the last 28 years, a Republican-controlled Senate for the last 35 years, and now they have a super majority. This super majority means they control all committee appointments, what items are even brought up for debate, any amendments that can be added to a bill, and can pass and bring into immediate effect any legislation without anyone from the Democratic party even voting. The House has been controlled for 16 of the last 20 years by Republicans. We've had a Republican Attorney General for the last 16 years, a Secretary of State for 28 years, and a Supreme Court majority for over 20 years. It is time we turn this tide of decline and unresponsive behavior, which we have the opportunity and responsibility of doing in the elections in November. I hope you have your ticket for the annual Chapter Picnic, to be held June 27, at 12:00 noon, in the pavilion, here at the Hall. We will be suspending meetings for the months of July and August, but have a baseball game scheduled for July 23, at Cooley Law Stadium with the Lansing Lugnuts. Ticket sales will be June 19-20 from 9 am to 1 pm. See you soon! Well, the first week of "April Showers" came in the form of snow and cold. Hopefully, it gets better real soon. I'm sure we're all ready for a break from the dismal weather we've had so far this year. Euchre players take note... the May 4th Tournament will be held at our own Local 659 Hall, instead of Local 599 as was previously publicized. Governor Snyder just stated he's stopping the supply of bottled water to Flint, while his administration, the DEQ, just approved the permit to allow Nestle Corporation to increase their draw of water from our fresh water supply from 250 gallons per minute to 400 gallons per minute. This was after a comment period, where over 80,000 people we re against it and around 7 comments were in favor of it! What happened to the people having a say in what happens in their community. This is free water they resell to consumers. When are we going to get fed up enough with this administration to take a stand and tell the legislators to do something about it? That's what we say about the month of March. The 6 weeks of winter that the groundhog predicted on February 2nd should be coming to an end soon. 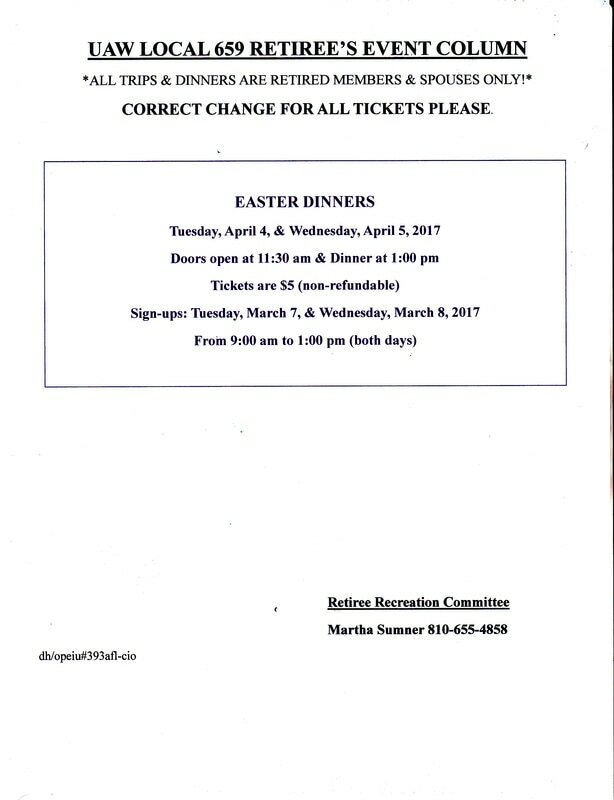 With Easter coming early this year, we will be having our Easter Dinners in March. I am hoping you are able to attend and see some of the friends you may have missed over the last couple months. Our "Snowbirds" will soon be returning from their annual trips to warmer climates. They'll be able to attend our annual Picnic on June 27th at 12 noon, in the pavilion here at the Hall. Don't forget Bingo on the first Tuesday of every month at 10:30 am., and our Meeting on the third Tuesday of every month at 10:30 am. I'd really like it if they would just leave the time of day alone. Saying Daylight Saving Time will save us an hour of daylight is like saying that if we start 2019 one day later and the following year we move it back again, then we will gain one day for the year 2018. Let's just leave it all alone and deal with the sun as it rises and sets in the natural order of things, as it has for centuries without our adjustments. Just a little recap (as if you need it.) The groundhog saw his shadow, indicating 6 more weeks of winter. We started out a week later with snow for four days straight. What does he know that we don't? I hope your celebration of Valentine's Day was all you wanted it to be. We also commemorated "White Shirt Day," where the autoworkers took on the huge corporation of GM to mandate that they be represented, and get better wages and some relief from the terrible conditions in the auto plants. There were no negotiated bathroom breaks. There were no excused absences... fired! There were no excuses for being late... fired! If you were slow or weak on your job because of fatigue... fired! There were men standing in line to take these newly created jobs even with those conditions. The same type of struggles those autoworkers had to fight through are coming again to us, as retirees, in the form of Medicare, Medicaid, Social Security. These are being incorrectly labeled as "entitlements." They are under attack in a greater way now because of the tax bill recently passed and signed, which will create a huge deficit in the coming years, according to the men and women who created the bill. Now they say we must cut these programs to pay for it! We must stand up and elect men and women who will have the courage to fight back for us, and change the way things are being bought and paid for with our tax dollars. Looking forward to our Easter Dinner, and some signs of Spring. Join us for Bingo, and our meetings in March. They start at 10:30 am on the first and third Tuesday of the month. Monday, January 8, 2018, we got hammered with several inches of snow overnight. This was after a couple of weeks of zero and sub-zero temperatures. By Thursday, January 11, we had 58 degree temperatures, and the snow had disappeared. I took that opportunity to take all the Christmas decorations out of the yard and off the house. On January 12 (the deadline for this article to be submitted for the paper), we received another snowfall of about 5 inches and the promise of cold temperatures again for the next few days. You've heard this before.... "If you don't like the weather here in Michigan, stick around a few minutes, and it'll change!" Our everyday life can change just as quick. A car accident, an unexpected illness, or death of a loved one or dear friend changes our life indefinitely or forever. And we have absolutely no control over it. Think for a moment of things we can control. Sometimes we can control our pets, our children, and even the checkbook! We can decide our President, the representation we have in State and Federal government. You know, the ones who are supposed to be doing "the will of the people." Let us resolve in this 2018 election year to be vigilant about what our legislators and representatives are doing, and take care of the things vital to us - our children and grandchildren. The current legislators have hurt us greatly, and need reminding they are there for our well-being, and not the "big business lobbyists" they rub shoulders with every day. In November, we need to be informed, and ready to make a real and tremendous change in Lansing, and in Washington. I hope you were able to attend the meeting January 16 with the VEBA Trust people and had your concerns and questions answered. Then, on January 16, 2018, at our regular business meeting, the VEBA Trust will be here again to aid in the transition to the Medicare Advantage Plan, for all of those making that switch. Your issues and questions should be able to be taken care of at that meeting. The other insurance entities are also scheduled to be there for any issues others may have. I hope your Christmas is all you want it to be and the New Year comes in even better. We have much to do as we enter the mid-term election cycle of 2018. How many times have you heard that, or told someone else that? While assembling the new piece of do-it-yourself furniture, you find one door doesn't quite close properly, and sticks when you try to open it. Then, you see a small plastic parts bag with some hardware still in it. When the instructions are found and read, it tells about the new found parts back in Step 2. Now, getting the assembly back to step 2 proves to be much more of a challenge that it was to bypass that part of the step. The dis-assembly causes another part to be damaged, plus puts a small dent in the side of the cabinet (easily hidden by putting that side next to the wall). Following the instructions after that proves to make the rest of the assembly go well. I recently had to assemble a tricycle we bought for our granddaughter, Sawyer, on her birthday. I carefully removed and unwrapped all of the components and laid them out, and pulled the instructions from inside the box. The steps were clearly labeled 1, 2, 3, 4, 5... etc., but there were no words. There were only pictures! Each step showed the parts to be assembled, where they went, and how it should look upon completion of that step! No words! (Maybe by doing it that way they felt there was no need for several translations of worded instructions). We can only hope that they never find a way to illustrate our voting ballots with no words. Then people might be elected (or not) by the way they look and not what they stand for (or not). We will be having our BINGO in December, on the first Tuesday. (December 5). 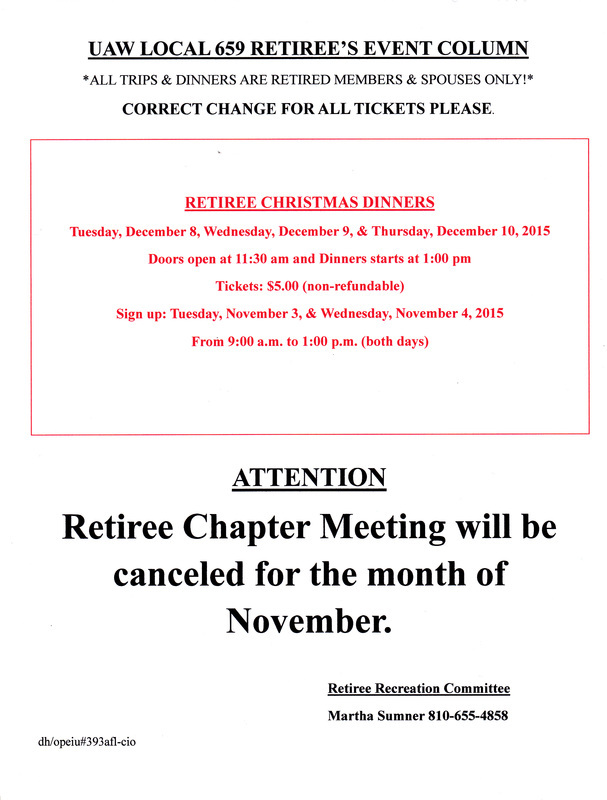 There will be NO meeting in December, on the third Tuesday. BOO! Halloween, one of America's favorite holidays, will soon be upon us. It is thought to have originated from an ancient Celtic festival of Samhain, where people would light bonfires and wear costumes to ward off roaming ghosts. Samhain is a Gaelic festival marking the end of the harvest, and the beginning of winter, or the "darker half of the year." There is more to be afraid of than roaming ghosts. It's the apathy of people who should be concerned about their responsibility to be active and voting in elections, and on legislation and legislative persons who do, or want to, create laws affecting us, our children, and our grandchildren in our daily lives. Be ready to vote, and vote in every election in your precinct on the issues! This is what keeps our democratic process alive and well. I'm sure you've seen the ads about the promise that they are proposing legislation to lower our insurance premiums by 20%. We may pay more for insurance in Michigan, but remember, we have the best insurance coverage in the Nation, with unlimited medical. Anything the insurance company lobbyists are writing (and that IS who is writing it) will not be in our best interests. Keep watching this bill as it becomes available, and tell your legislators that we want what is best for us, and not the high-profit insurance companies. Note: There will be no Bingo on Tuesday, November 7, 2017, because of our Thanksgiving Dinners, and no meeting on Tuesday, November 21, 2017, because of Thanksgiving Day on the 23rd. Don’t forget, as we get back into the swing of things, we meet to play bingo on the first Tuesday of every month at 10:30 am. At 12:00 noon we have donuts and coffee, hot chocolate, or tea. The third Tuesday of every month at 10:30 am is our regular business meeting with a light lunch at 12:00 noon, and afterwards we also play bingo. Many times at our bingo meeting on the first Tuesday we pass on information that may be needed before the regular business meeting on the third Tuesday. Whether we meet just for bingo, or have the business meeting, lunch and bingo, we have a good time of fellowship with friends. Come join us. Don't forget our annual Labor Day Commemoration, 10:30 am on September 4, at the Sit-Downers Memorial (located on the grounds of the UAW Region 1-D offices, at the corner of Van Slyke and Atherton Rd.) There will be refreshments afterwards, hot off the grill. We take this time to honor the American Labor movement and the contribution workers have made to the strength, prosperity, laws and well-being of our Country. On Tuesday, September 5, we will be back in session with Bingo at 10:30 am, ending our 2 month recess for the summer. We need to elect three (3) delegates to the Region 1-D Retired Workers Council at our meeting on September 19. The next meeting of th 1-D Retired Workers Council will be October 30, and we want to have a full slate of delegates to attend the meeting. 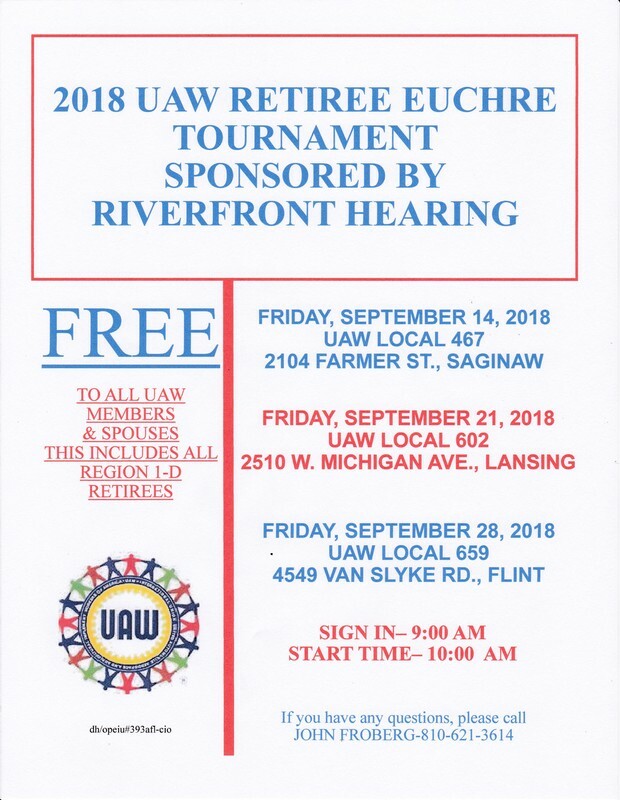 It will be at UAW Local 467 in Saginaw. We will carpool to the meeting as necessary. Please consider serving in this capacity, as we need more people to be involved in our community of Retirees across the state. If you received a letter from the Trust concerning your Medicare and Blue Cross coverage changes, you will want to attend our meeting October 17, 2017. Representatives from the VEBA Trust, and all the insurance entities, will be on hand to inform us of the changes coming in January 2018 and to answer any questions about those changes. The Second Continental Congress of the United States voted July 2, 1776 to approve the "Resolution of Independence," thus declaring the United States (thirteen colonies) independent from Great Britain rule. Congress then turned to writing the "Declaration of Independence," explaining this decision, and finally approving it on July 4, 1776. An interesting note, John Adams wrote to his wife, Abigail, stating, "The second day of July 1776 will be the most memorable epoch in the history of America. I am apt to believe that it will be celebrated by succeeding generations as the Great Anniversary Festival. It ought to be commemorated as the day of deliverance, by solemn acts of devotion to God Almighty. It ought to be solemnized with pomp and parade, with show, games, sports, guns, bells, bonfires, and illuminations, from one end of this continent to the other, from this day forward forever more." Looks like we pretty well fell in line without ever reading her note from him. July 4th became a federal paid holiday in 1938. We are fortunate to have the freedoms we enjoy as Americans. Let us keep vigilant in protecting them by voting right and keeping our representatives informed of our desires through whatever means we have available. - Chase or hide from any kind of wild animal, in the living room, kitchen, or their bedroom/playroom. - Play with an invisible friend that listens to and obeys any command or request. - Obey the same request or command from that invisible friend. Occasionally, that "invisible" friend may cause real trouble because they cause or do things that are normally off limits. This could affect furniture, carpet, walls, hairstyle, and limitless other things too numerous to mention. In the end, there will not be anyone around to accept responsibility, or be accountable for the dastardly deed or deeds. In every instance, no response can be obtained. When we were children, we played, acted, and talked like children. Now that we are adults, we should talk, act and react like adults, with responsibility and honesty toward our peers. It would be a great thing if all the elected leaders and those who represent us in government would be adults in their responsibility to us and each other. Our English language has some interesting collectives of nouns for various groups of animals. We have ... a "herd" of cows ... a "flock" of chickens ... a "school" of fish ... and Lions gather in a "pride." Then there is a "murder" of crows ... an "exultation" of doves ... any maybe because they look wise, a "parliament" of owls. But how about baboons? Believe it or not, a "CONGRESS of BABOONS!" That could explain a lot of things! Here are a few dates coming up that you may need to take note of. 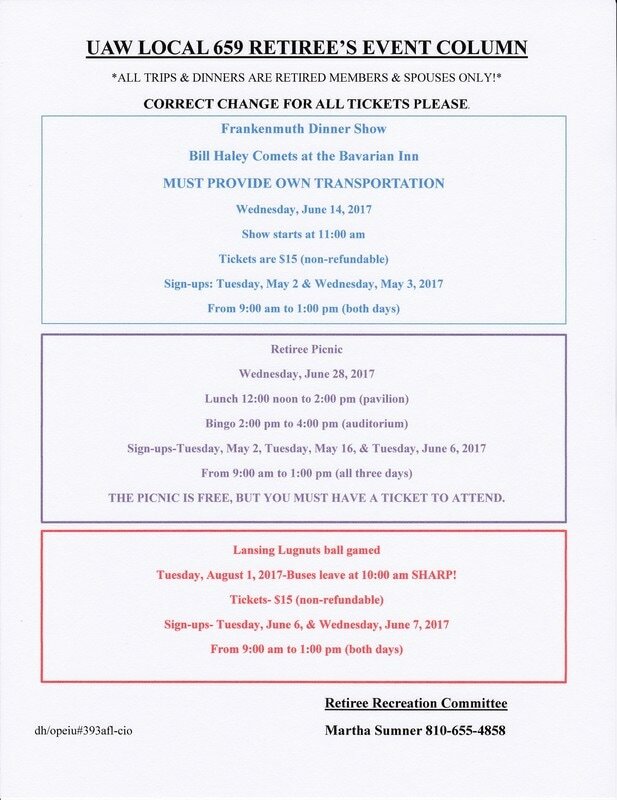 May 2, 2017 is our regular Bingo, Picnic tickets will be available for the June 28th picnic on this date also. On May 2nd and 3rd, we will be selling tickets from 9 AM to 1 PM for the Bavarian Inn Dinner show featuring Bill Haley and the Comets, on June 14th at 11 AM. You must pick up the tickets in person. 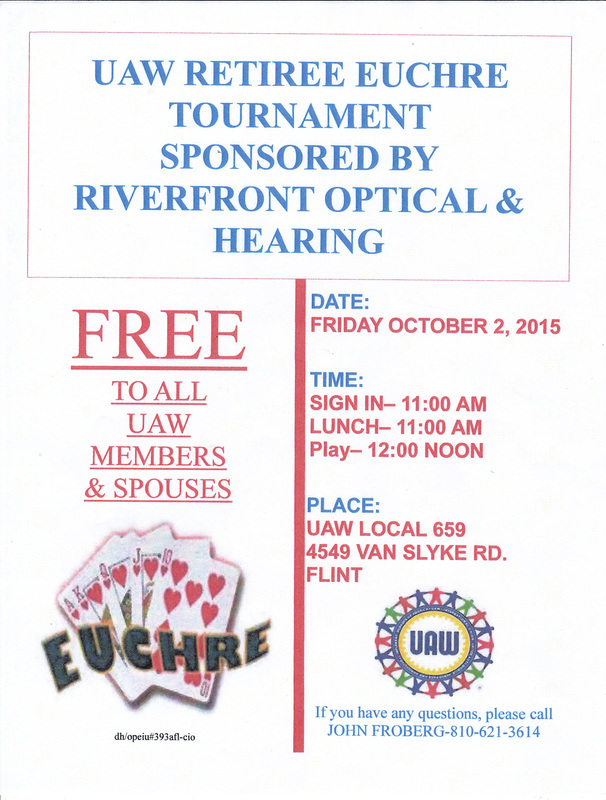 May 5th is the 1-D Flint Area wide Euchre Tournament at our own Local 659 auditorium. Sign up begins at 9 AM and play begins at 10 AM. There is no fee to play, and prizes are awarded for the top finishers. Lunch will be provided. May 10th is the trip to Fire Keepers Casino, busses leave at 10 AM. 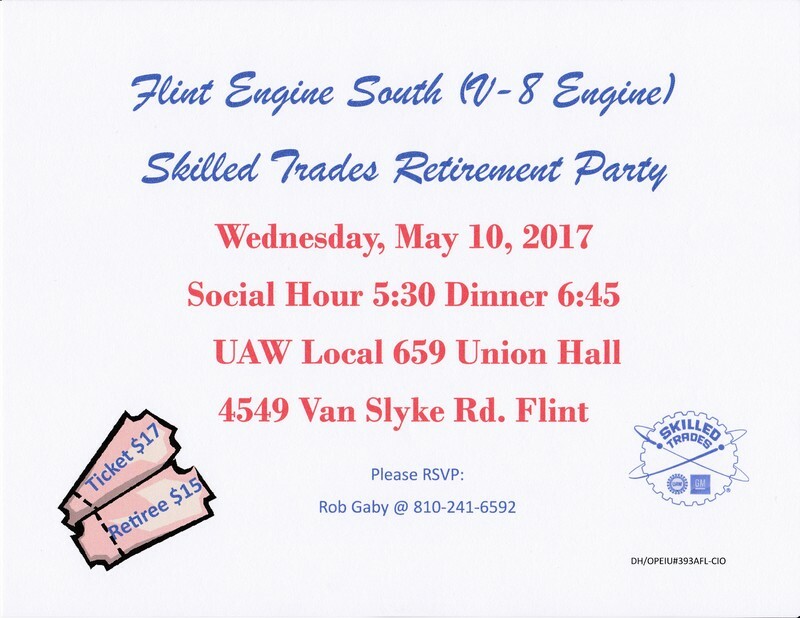 May 10th is also the Annual Flint Engine Skilled Trades Retirement Dinner at 6:45 PM, doors open at 5:30 PM. 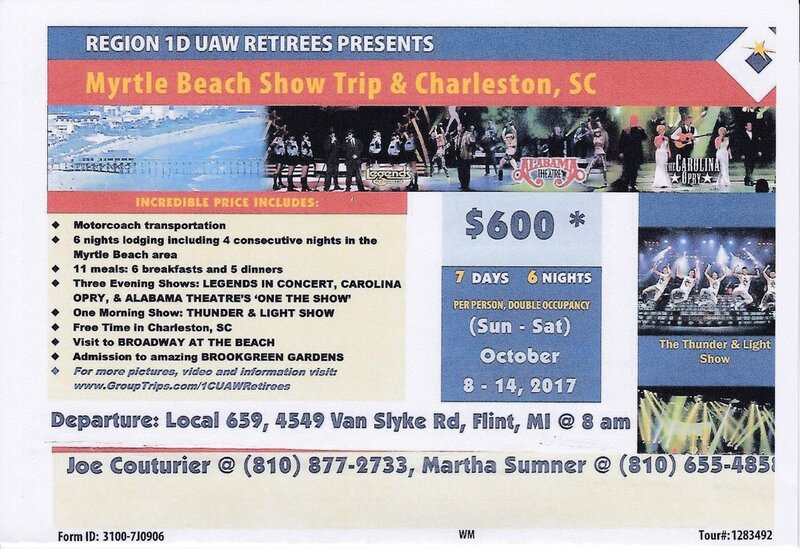 Tickets for retired workers are $15. May 14th is Mother’s Day, of course. May 16th is our regular business meeting with Bingo. Picnic tickets will also be available this date for the June 28th picnic. May 24th is Senior Power Day at Crossroads Village. May 30th through June 1st is the Conference at Black Lake. Hopefully this is a complete and accurate list. St. Patrick is a patron saint of the Catholic Church, and St. Patrick's Day is a celebration of his death on March 17, 1461, rather than his birth. He was not Irish, but born in Wales, or Scotland. He was sold into slavery around the age of 16, but escaped several years later to a monastery in England, where he studied for 12 years. He returned to Ireland and spend his time teaching Christianity. One legend has it that St. Patrick drove all the snakes out of Ireland. The truth is, there is no evidence that snakes ever existed in Ireland. Blue was the original color of St. Patrick's vestments. Green later became associated with Ireland most likely because of the plentiful rainfall creating a wonderfully green countryside. Today, the country is often referred to as the "Emerald Isle." The shamrock is not the official emblem of Ireland. It was used by St. Patrick in his Christian teaching about the Trinity. Although "green" and "drinking" are associated with St. Patrick's Day, from 1903 -1970 Irish law declared St. Patrick's Day a religious observance for the entire country, and the pubs were closed for the day. In 1970, March 17 was re-classified as a National Holiday, thus allowing the pubs to be open. Catch a leprechaun, and he will grant you three wishes to gain his freedom back. Beware, they are little tricksters. The pot of gold he hides is very elusive, too. Don't forget, sign up for offices in the Chapter is March 27th, 28th and 29th. Elections will be held April 20, 2017 from 6:00 am to 6:00 pm. Our chapter meeting for April has been moved from Tuesday, April 18th to Thursday, April 20th. The time remains the same at 10:30 am. Ticket sales for the Casino Trip will be Wednesday, April 19, and Thursday, April 20, 2017 from 9:00 am to 1:00 pm. There doesn’t seem to be too much love being thrown around the political arena, or the news media so far this year. It sometimes even seems like the election is NOT over. They’re still bickering and complaining of the news coverage being unfair, biased, and not factual. The size of the inaugural crowd has taken several days of coverage and may not be over for months to come. We have run the gamut of ”executive orders,” as another way of governing to get ones way, and belittling anyone or anything that disagrees, or goes against it. Let me just say this… The Election is Over! Many may not feel their vote did not matter, as things didn’t go the way they thought it should, or wanted it to. Here’s some advice a Dad gave his son…Spend 5% of your time to figure out if you got a good deal, or a bad deal. Spend the other 95% of your time figuring out what you’re going to do about it! We MUST stay informed, stay active, and make face-to-face contact with the legislators to express our opinions on Social Security and Medicare to all of them. Keep in mind, if you are thinking of running for an elected position on the executive board, that the sign up is March 27th, 28th, 29th. The election will be held on April 20. We now see that the years ahead may be different from any we've ever seen before. This President seems intent on changing the way our government sees people, and reacts to their concerns. He thinks he knows more than many of the agencies we have come to trust for many years. He says he has information no one else knows. That type of persona should really scare us. It does me. In the next four years, we need to be the best informed, and best involved, than we have ever been in our lives. Keep in contact with the elected officials by phone, email, and letter expressing our concerns for the issues affecting our lives. Attend any and all "town hall" meetings where they are present to get first-hand information and express views face to face. Remember, the package of bills we fought against concerning new taxes for roads, bills against no-fault insurance, diesel tax hikes, auto registration rate hikes, etc? We lobbied against them and won. They backed away. Well, here they are again. First was the 7 cents per gallon we were hit with as of January 1, 2017. They are considering no-fault next (in the name of us, the consumers, of course). That is really brought on by the insurance companies lobbying them big time! They are also working on revamping the pensions for public employees, which will affect all pensions in the future. So those same bills we fought against before are coming back one at a time. We must keep informed, vigilant, and contact the legislators responsible for this. The VEBA Trust and insurance providers will once again be at our February 21 meeting to keep us informed on the benefit program. This year, we will be electing new officers or re-electing current officers. Watch the Searchlight for details. We are once again looking for someone to take care of the auditorium for Hall rentals and setup for Joint Council, effective March of this year. If you are interested, see me for more information. The Legal Service negotiated in our last contract is still not available as of this writing. Keep watching and waiting. See you soon. Seems like only yesterday, (November) we were giving “THANKS” for the many things we are fortunate to have. Family, friends, health, wealth, and the many other material things we enjoy here in America. Many had small reunions with work friends, school buddies, and just friends and family. December had a slow start, then cooler temperatures than we had been experiencing started creeping down on us with snow thrown in for good measure. Then people started shopping, sometimes, “FURIOUSLY”, to get that gift they think will make that special person or persons get all starry-eyed on Christmas Day. I hope all your dreams, and wishes were fulfilled this year at Christmas. For some, this time of year is the most depressing and lonely. Surround yourself with close friends, and keep being a part of their life. You may need them as much as they need you. We have many challenges coming in the next four years, but with all of us working together we will meet and surpass the goals set before us. As we enter the new year, make your resolutions, aiming high. Let’s get things done together. Merry Christmas, and a Happy New Year, from your Executive Board- Ron Ancira, Ron Pruett, Joe Couturier, Martha Sumner, Brian Judd, and Rudy Armstrong. I hope your Thanksgiving was good and enjoyable. We have a lot to be thankful for as Americans. The transition of power has started and we should support our newly elected leaders, as well as those leaving office. Change is possible through the political process we subscribe to in our democracy. It was a bitter and hate-filled campaign from beginning to end, with an ending that still has many people on both sides filled with anger and hate. Take the time and make the effort to do something good for someone, and hope it gets passed forward. Our country needs healing of some deep wounds on both sides. It can be said, with almost certainty, that there are two words you have probably used together in a sentence many times. It you haven't used them, you have heard them together in the same sentence, and most likely agree with them. There are two things we know for sure, "death" and "taxes." Consider for a moment "taxes." We all hate to pay them, and if we had our way, would like to pay less, or no local, state or federal taxes at all. It is safe to say though, that if you are a member of a club, organization or fraternal order, you pay some form of dues or membership fee to enjoy the benefits of belonging to that organization, even if it is just name recognition of belonging. If you happen to belong to one that doesn't require you to pay, look around and you will see someone or some other organization is funding their activities and benefits. As you consider the amount of dues or taxes you pay, or want to pay, keep in mind the benefits afforded by them. Medicare, Medicaid, Social Security benefits, hospitalization, and discounts on products or services, are benefits of these programs. Take a look at one itemized bill from a hospital for a minor or major surgery, or even an in-patient office procedures, and you will agree, the premium and co-pay is worth it! Taxes or dues, although we don't like them, are necessary to pay for these programs for our overall best interests. As you vote, remember those who will work to keep the funding of these programs solvent for years to come, and not the people who would try to privatize these programs leaving us vulnerable to big business, and continue tax breaks for the huge corporations, and the top 1% of our society, leaving the real burden on the middle and lower class. In reading an article about Hong Kong and their fight to gain a greater democracy and autonomy from mainland China's communist government party in Beijing, some comparisons came to mind. They are allowed to elect 40 members of their Legislative Council. Various industry and civic groups (controlled by pro-Beijing forces) hand-pick the other 30 members. It just looks like they have the majority control. The mainland government also gets to appoint Hong Kong's chief executive. That started me thinking about the United States of America and more specifically here in Michigan and our elections. We do elect those who would represent us to fight for the things benefiting our needs and way of life. Think back a few months, when our illustrious Governor, and the Republican-controlled Legislature, decided we needed an Emergency Financial Manager to take over our local government and dismiss the people we had elected. After we voted that out, they decided by a different method that they would reinstate him in such a way that he could not be voted out! Does that feel uncomfortably familiar to Hong Kong's plight in their relationship with mainland China's Beijing? When you vote in the upcoming November presidential election and our state election, remember who will fight for you, and has your best interest at the forefront of their agenda. It is very important that we take back control of the State and Federal Legislatures, along with the governorship, and presidency. Make sure you are registered to vote before October 11, and vote absentee ballot for convenience. The latest report is that straight party voting WILL be allowed in this election. I hope you have been enjoying the hot weather we've been having. We haven't had to spend as much time mowing the lawns as in past summers. There is no let-up in the rhetoric between candidates, and promises to only intensify until the election in November. Please stay informed, and involved in the process. This can not be a spectator sport. The future for us and our children/grand children is at stake. We start playing Bingo again on September 6, 2016. There are three (3) Euchre Tournaments coming. You may play in all of them. Registration is at 9:00 am and play begins at 10:00 am with lunch provided afterwards. 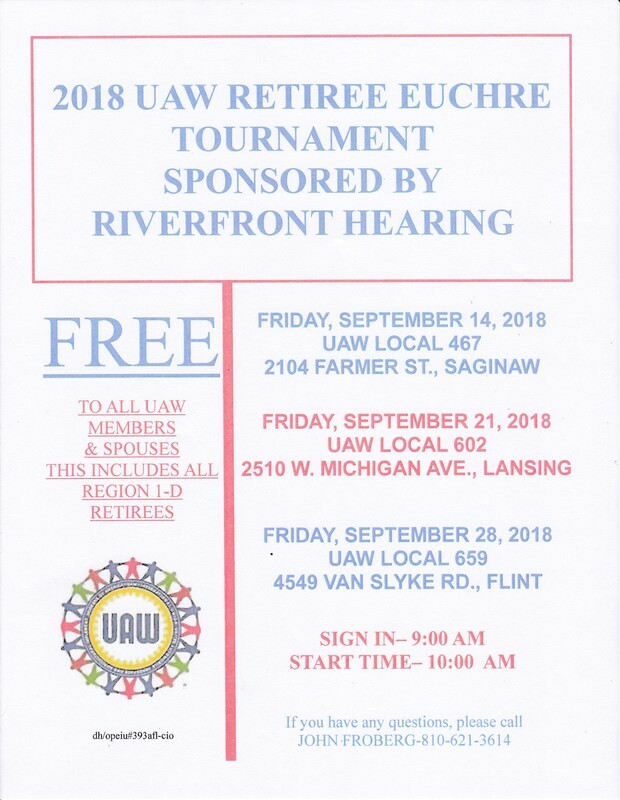 September 9, 2016 at Local 467 in Saginaw, September 16, 2016 at Local 6000 in Lansing, and September 23, 2016 at Local 659 here in Flint. The Sam Duncan "Night to Remember" is on September 17, 2016 at 7 pm. At our regular meeting held on September 20, 2016, we will have the VEBA Trust in to inform us of any changes we can expect in our coverage. The insurance vendors will also be there to answer any questions about their coverage plans. The governor, (elected by us) appoints the public service commission, which sets the rates for the gas, and electric energy we use daily to prepare our meals and heat/cool our homes. We sleep on safe mattresses because of regulations set by the federal bureau of standards which is controlled by the U.S. Congress, (elected by us). The President, (elected by us) appoints the Federal Communications Commission which approves and regulates TV channels. The board of education, (elected by us) or appointed by the government officials, (elected by us) controls school buildings, bus routes, school equipment and teachers. Workers compensation and unemployment benefits are determined by various government officials, (elected by us). The highway commissioner, appointed by the governor (elected by us) controls the repair and construction of the highways we travel. Almost every part of our daily life is affected by people, WE ELECT! We are involved in politics. Days after England voted to leave the European Union where approximately 14 million voted to leave, and 13 million voted to stay in, you saw in the news that there was a movement to have a "do-over" vote because so many people were actually shocked that Britons had voted to leave. Of course it did not happen, but don't be one of those people that wake up the day after the election saying, "I didn't believe that could happen! Make sure you are registered to vote, and VOTE!" We must also stay informed on what our elected officials are doing between elections, so we vote wisely. A note about the meeting in June. We have been in contact with the Flint MTA. They assured us that their failure to fulfill the obligation they made to us on that date will never happen again. Seems that is the word of the month. Graduations from pre-school, kindergarten, high school, and college are all celebrated this month, and those completing them surely deserve CONGRATULATIONS for their efforts and accomplishments. But wait... there's more! June, the sixth month, got its name from the Roman Goddess Juno, who was deemed the Goddess of Marriage. It is believed that marriage in June carries the promise of health and prosperity for the happy couple. June, falling in the middle of the year, and having the longest days of the year, lends itself to being more pleasant and warmer. Attendance at weddings is easier because schools and colleges are in recess for the summer. BUT WAIT... THERE'S MORE! In medieval times, it was not uncommon for people to bathe only once a year and that generally fell in the month of May or June. What better time to get married than when one is looking good and really at their most presentable state! I am looking forward to seeing everyone at the picnic on July 19, at the pavilion. See you soon. The May flowers we were expecting, because of the April showers, (in whatever form they were last month), have arrived. They are so plentiful; you see them everywhere you look. They line the roadways. In fact, my neighbors seemingly have planted an overabundance of them. There are even a multitude of them surrounding MY house. The color is the only thing that would be nice to see vary more. Yellow, as in “dandelion” gets boring. They’re here, so enjoy the “Mayflowers,” you probably didn’t even plant! I hope you have already begun to prepare for the upcoming November presidential election. The candidates will be selected soon, and we will have the rest of the summer to listen, and watch the political ads. I’m sure we’ll be tired of them by November, as we already are of the primary side of it. If you have never considered voting by absentee ballot before, you should consider it this year. No longer can someone vote a straight ticket by just marking the box at the top of the ballot. There are predictions of much longer lines at the polling place because of that fact alone. Many more ballots will be spoiled, than in the past, because of being improperly marked. Voting absentee, has the advantage of being able to take enough time to accurately select the candidate you wish to vote for in each office. When it comes to voting for proposals, you can take the time to research and read each one and vote them more intelligently. The most important thing this November, is that you VOTE, and vote correctly and intelligently! The best way to do this is by having your ballot and setting down to read and mark it accurately in the privacy of your own home. 1. Request a ballot from the clerk’s office, either by mail or in person, or an immediate family member can deliver the request. The ballot will be mailed to you. 2. Vote and return the ballot by mail, or it may be delivered in person to the clerk’s office. Now is a good time to begin the process of obtaining an absentee ballot. April showers bring May flowers. I wonder, does that include snow, sleet, and freezing rain showers to bring May flowers? That is how we started April... remember? We'll soon see if the flowers in May are a reflection of April's showers! I believe we as Americans are missing a great opportunity to see our country begin and continue on a path to grow a great and strong economy. Buying goods and products NOT made in America is contributing to our own demise. When we BUY AMERICAN, it creates a demand for American-Made products. American companies will respond to supply and demand from the American factories employing American workers, earning American wages, who also pay taxes in America. About 75 percent of consumer spending ends up going towards Social Security, Medicare, education, roads, parks, and other programs we have come to rely on, and expect. So by buying American, we are supporting the very people who work and pay taxes here, and the companies who pay taxes here. Foreign workers don't pay taxes here. Foreign companies operating here do not pay near the amount of tax that American companies operating here must pay. The choice is easy... BUY AMERICAN! At our meeting on May 17th, the VEBA Trust and Insurance vendors will be here to update and inform you on any changes, and answer questions you may have. Mark your calendar to attend. I haven't been watching the Republican debates, but have seen some of the news clips about them. Early on, they seemed to be campaigning against President Obama more than each other. Now they are locked into destroying each other, by personal attacks on physical characteristics, family, background, and just elementary school-type remarks aimed at each other. There has been no real debate of issues or policy that affects, or will affect, the American People. I did watch the Democratic debate held in Flint. At first, it looked like it may be a love fest, concerning Flint, and the water crisis, which is, of course, Newsworthy, and bearing heavily on all of Michigan. They did get to debate several other issues, and were pretty well prepared to express their position, and how they differed from each other. We've had almost 8 years of a do-nothing, Republican-dominated Congress; with the first 4 years dedicated to making sure Obama was a one-term President. When that did not work, why couldn't they at least try to do some good for America? We need a massive change of power and representation in Congress. They have an agenda all ready to go, if we do not get out the vote and make changes in the people now holding the majority of votes in Congress. Some things that may happen are: SS benefits changed for the worse, increased age for Social Security, the privatization of Social Security, and drastic changes to Medicare/Medicaid, just to name a few. Our State legislators have not done us any favors either. With the passing of the bill stopping us straight-party voting, we now must vote individually for every candidate. This will slow voting at the polls tremendously, and I feel will cause many more spoiled ballots. Everyone should begin, if you haven't already, voting by absentee ballot. Do you love it when the Groundhog sees his shadow. or do you love it when he doesn't see his shadow? Isn't it lovely when snow that falls at this time of year is melting or gone in a few days? Do you remember the first girl or boy you loved and thought you would grow up and marry? Do you love morning coffee and reading the morning paper? Love visits from your grandkids when they arrive, and again love when they leave with Mom and Dad? Love to plant your garden in the spring and love to harvest in the fall? Love to read a good book? Love to travel, or love to stay home and relax on the porch with a tall glass of iced tea? Love to go to church? Love to go on long exciting trips, and love to come home and sleep in your own bed again? Love to shop for new clothes or go to rummage sales and buy old tools? Love to do woodworking projects or jigsaw puzzles? Love to make quilts or sew? Whatever your love is, I hope this Valentine's month was one you will remember in the coming years. By now, all GM Retirees on record on or before October 1, 2015 should have received the $500 bonus check that was negotiated in the contract. If you have not received one and would like to check on it or your eligibility, call Fidelity at 1-800-489-4646 and choose the retirement/savings option. According to recent information, the Legal Services benefit that was also negotiated should be available in the coming months, due to paperwork that must be completed and filed before it can resume. We will hear something soon and keep you updated as soon as details about the coverage become available. Remember that our Local will be hosting the White Shirt Day Celebration on Thursday, February 11, commemorating the 1936-1937 Sit-Down Strike. Be sure and help honor those Sit-Downers. Christmas cards are all sent, wishing friends and relatives a Merry Christmas and a Happy and Prosperous New Year, proclaiming Peace on Earth as we celebrate the birth of Jesus thousands of years ago. These are some of the thoughts we have at this time of year. Now visualize December 30, 1936, (79 years ago), at 8:00 p.m., the workers at Fisher Body Plant #1 locked themselves inside, and began the historic "sit-down" strike against the manufacturing giant, General Motors. This had to be a "sit-down" strike so they would be inside the plant, and effectively shut down operation of the plant. If they were outside picketing, there would be the possibility of scabs being brought in to continue the work operations. Some of their demands were: the UAW be recognized as the only bargaining agent, GM would stop sending work to non-union plants, a fair minimum wage be enforced. Some procedures would also be put into place to protect workers from injury. Sound familiar? ... Stop outsourcing... better wages... Safety... the same things workers want and must fight for today. After 44 days of no heat in the plant (during January), meager food that was smuggled in with the help of the Women's Brigade, and vigilant guarding of the shop entrances - they won! 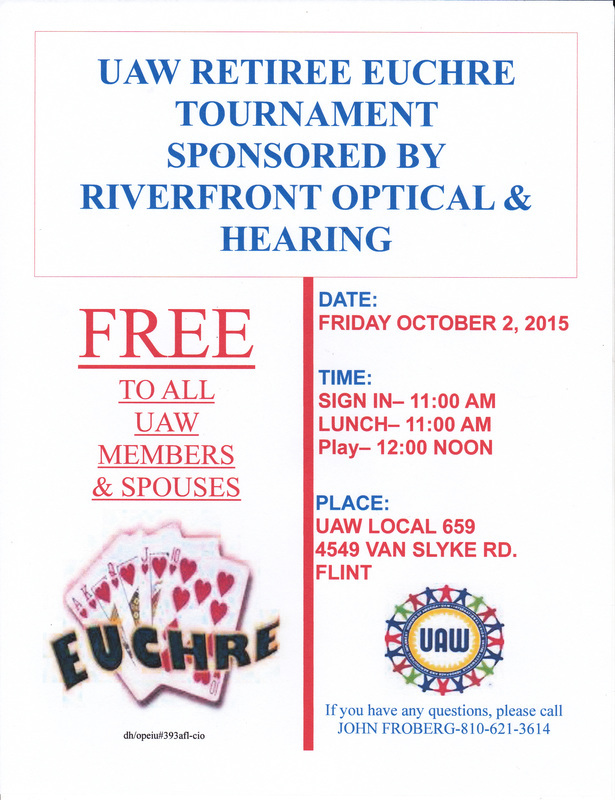 Among other things, they did win the recognition of the UAW as the bargaining agent. They received a 5% wage increase, and could now SPEAK in the lunchroom. What a way to spend the time that workers now enjoy as "Christmas Holiday," with pay. Join us at the Hall on February 11, 2016 at 10:00 am to commemorate this historic occasion. Our monthly meeting on January 19th will begin at 10:00 am due to the VEBA Trust and insurance representatives being there to update us on 2016 programs and answer questions you may have on your coverage. January 20, 21, and 22 will be the sign-up dates for the office of 2nd Vice Chairman of our Chapter. The election will take place at our meeting February 16th from 9:00 am until 1:00 pm. See you soon. Armistice Day, later changed to Veteran’s Day started when an armistice or temporary cessation of hostilities, between the Allied Nations and Germany went into effect on the eleventh hour of eleventh day of the eleventh month. For the reason November 11, 1918, is generally regarded as the end of “the war to end all war”. In the 60 and 70 there were laws and legislation signed changing the day to make it observed creating a 3-day weekend which caused it to be celebrated in late October one year, so it was changed back to the 11th. Also in that time it was changed to honor all Veterans of all wars. Veteran’s Day is now observed on November 11, regardless of what day of the week on which it falls. This observance on November 11 not only preserves the historical significance of the date, but helps focus attention on the important purpose of Veterans Day; A celebration to honor all America’s Veterans for their patriotism, love of this country, and willingness to serve and sacrifice for the common good. Thank you to all our Veterans! The project of re-covering the seats of the chairs in the auditorium has begun. Approximately 24 workers spent 4 days; striping, cutting, stapling, and painting chairs. Over 240 chairs were completed, with about 175 more to be done. The project will resume soon after Christmas, as the hall will be in use much until then. We are planning to have the Benefits Trust and insurance carriers at our meeting in January to inform and answer questions about coverage for 2016, so put it on your calendar. 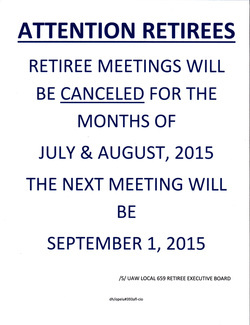 You can check the highlights of the tentative agreement reached between UAW and FCA at uaw.org. Many times the agreement reached at one of the big three becomes a pattern for negotiations at the other two. If that remains true in this case, we expect, as retirees, to get a $1,000.00 car voucher and the legal service benefit back. It will be interesting to watch and see what their membership thinks about their part of this agreement. Hopefully you bookmark the website, uaw.org and go there often to keep up with news from our International Union. It has a Retiree section that has information, and you may also read the Solidarity magazine online if you happen to lose your mailed copy. In the near future, our Retiree Chapter is planning to re-cover the seats of many chairs in the auditorium that are showing wear or torn. This is going to be a fairly large undertaking and will require many people to make it go smoothly and finish in a timely manner. We have the seat material and are collecting the other materials needed. Ron and Lyn Pruett are the “Field Marshals” on this project so stay tuned, as we try and select a day or two to complete this project. There should be work that anyone and everyone can be involved in. Don’t eat too much Halloween candy. Social Security, which was originally designed to be supplemental income for retired Americans, has become a critical part of their livelihood. Many would not be able to afford decent nursing home care, or even be forced out of their homes, without it. If Social Security had been privatized before the economy crash of 2007-2008, which wiped out billions in stock values, many on Social Security at that time would be destitute. Most Americans love Social Security, but every one of the republican candidates for president seem to have a desire to push the retirement age up to 68-70, cut the benefits, or privatize it. Think about this… Over one half of the money raised by the republican candidates since June, has come from just over 100 families. That means the people that the republican candidates are being lobbied by do not even make up the 1%. It’s a much smaller group. A republican president, with a republican Senate and House of Representatives would have a clear path to do whatever he and this smallest group of wealthy families wanted with Social Security and other ideas they may come up with. Be careful who you support and vote for in the upcoming elections. Where are the “Dog Days of Summer” I’m not complaining, but it seems we haven’t had the hot sultry days usually associated with this time of year. Actually these temperatures are enjoyable. Warm days and cool nights, makes good sleeping weather. Heat has however been building around the Republican Party Presidential Candidate selection process. With so many candidates, it promises to be a long name calling, mudslinging time until their convention in July. Hopefully the Democratic Party candidates use this time to develop a platform of integrity and one that meets the needs and wants of the people they hope to represent. I’m afraid the short reprieve we’ve enjoyed from political ads is about to end until November, 2015. At this time we know of no changes to our health care insurance, except Health Plus is pulling out of the Lansing area. If you are affected by this, you will be notified by mail, and have the option to choose another health care provider. 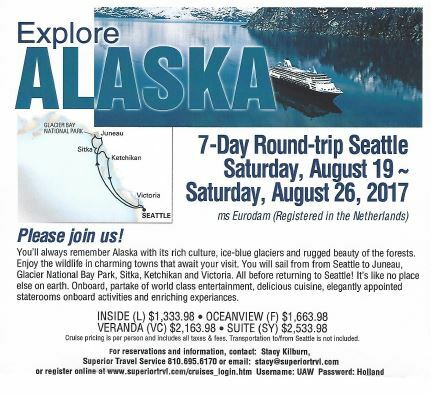 We also have a few tickets available for the Firekeepers Casino trip on September 10, 2015, if interested, contact Martha or Joe. Have you been to a wedding reception where the caterer excuses the tables to address a buffet line, and yours seems to be last? Have you been to a sit-down dinner where they bring the meal to the table and your waiter/waitress is slower than others and you get yours last? When you go to McDonalds drive-thru you choose the shorter of the two lines. The longer line seems to move much faster than yours. Many people pick the shortest line or the one with the fewest items to check out at a department or grocery store. The person who is next in line for the cashier to wait on pays for their items with a check and has to be approved by the manager tends to hold the line up. If a customer has an item that's on sale and it was marked incorrectly the manager or bagger must find the correct price for verification. In a traffic jam on the expressway you finally get to switch over to the lane that is moving and someone from it stops and the lane you just left moves on. Even when you cross the border you watch to see which booth is letting the cars through the fastest and after you switch the old lane moves faster than the new lane. During the time of the events you may feel ignored, forgotten, left out, get frustrated with others, and even get mad. I have a thought I always keep in mind, "Everyone gets a turn" it may not be the first, but we will always get there. It doesn’t seem possible to be halfway through the year already. Weather wise, we haven’t seen extreme heat for any stretch of days, but gardens are growing well. It seems that any route you take, to anywhere you want to go, will take you by orange barrels, flagmen, orange cones, and lane changes. It’s a banner year for road and bridge work. Hopefully with all this work going on, our roads and bridges will be in good shape to withstand that harsh weather we can expect this winter. And why “Flag Day” on June 14th you ask? That’s the date in 1775 Congress “authorized” American Flag….almost a year after our “Declaration of Independence” from King rule. As you fly your flag this July 4th, you may rest easy knowing that there is not just ONE American Flag on the moon, but SIX! As usual, we’re not meeting in July and August, so watch the “Searchlight” for activities. 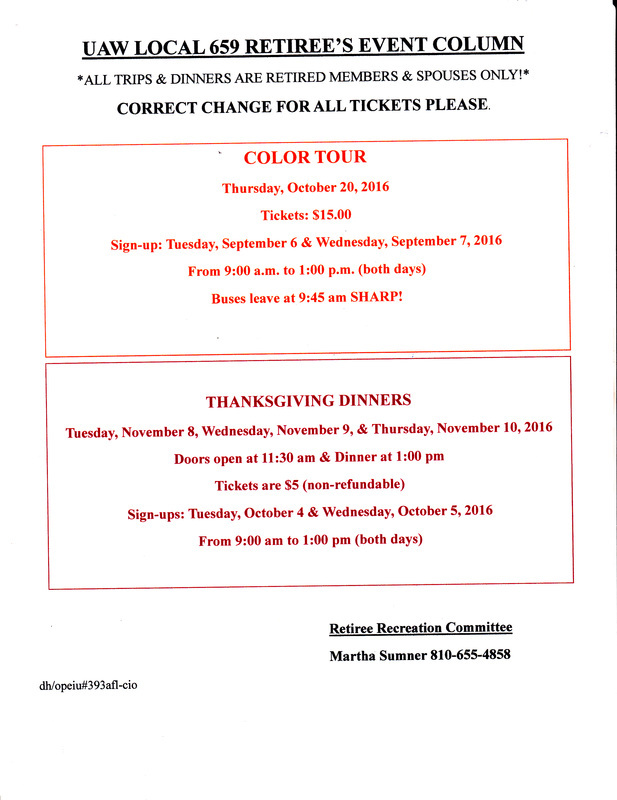 We will be selling tickets for the October, fall color tour on September 1st & 2nd, and Bingo will follow our next meeting on September 1st. If you’re traveling this summer, watch out for the other guy... he may not be watching out for you. Our federal holiday, Memorial Day, earlier called Decoration Day had its beginning after the Civil War to commemorate those who died in that war. Early in the 20th it was extended to honor ALL Americans who died while in the military service. Originally it was celebrated in early May, but in 1868 was proclaimed to be celebrated on May 30th because that date was not the Anniversary of any particular battle. Some say that the flowers are optimally in bloom then too. Michigan made Decoration Day an official holiday in 1871. The name Memorial Day gradually became prevalent after World War II and was declared official by Federal Law in 1967. In 1968 The Uniform Monday Holiday Act moved it to a specified Monday to make a three-day weekend. Now we celebrate it the last Monday in May every year. This year, May 25th, many businesses and others feel this also marks the un-official beginning of summer. Labor Day seems to signal the last day of summer for many. If you display the flag of the United States, it should be raised full-staff in the morning and then Immediately lowered to half-staff. At noon it should be raised back to full-staff for the remainder of the day. The half-staff position remembers those who gave their lives in service of their Country. At noon their memory is raised by the living who resolve not to let their sacrifice be in vain, but to rise up and continue the fight for liberty and justice for all. Memorial Day, which remembers those who died while serving, should not be confused with Veterans Day that celebrates the service of all U. S. military veterans. Whether you participate in Memorial Day by watching, or marching in a parade, or by decorating graves, may this be a great day of remembrance, reflection and relaxation for you. With Thomas Jefferson’s Birthday April 13th, I was reminded of his words “We in America do not have government by the majority. We have government by the majority who participate”. On May 5th we have the responsibility to vote. One item on the ballot will be Proposal 1, which means to increase the sales tax from 6% to 7% and we are led to believe this will be used to fund road repairs. The truth is that there are other bills, including in this proposal that greatly affect the per gallon price of fuel. To start, the price of gasoline will by the formula in one of the bills lead to a price increase of $0.41per gallon this year alone, although some if the other bills in this proposal may create revenue for the general fund, only a small percent will actually go to funding for what we have been led to believe it is for. Exercise your right/responsibility to vote… and vote wisely. We’ve begun sign-up and ticket distribution for the Tuesday, June 30th Picnic. 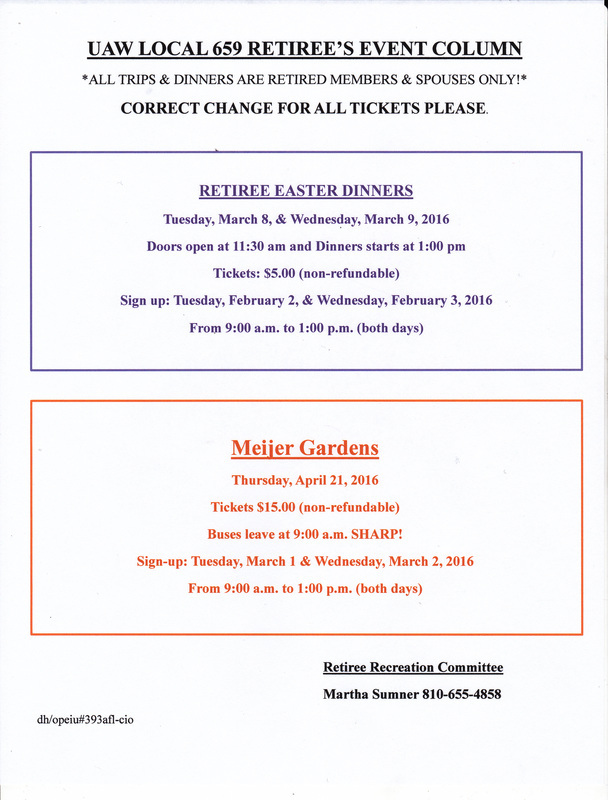 Be sure and sign-up and get your ticket, at the May 5th Bingo, or May 19th Chapter meeting, which is the deadline. I heard on the radio this morning (March 7), that some Republicans are introducing a bill that would change the electoral vote system in Michigan to where a candidate would not have to carry the entire State, but would be able to get all of the electoral votes. This in addition to the redistricting that they were able to accomplice before the last election will further bias our representation and election power. I’m sure you have also heard about the proposed amendment to the state constitution involving a 1 percent increase in the sales tax from 6% to 7%. It’s a “Transportation Funding Package” which has several bills in it. One, (HB 5477) amends the Motor Fuel Tax (2000 PA 403) to convert the current FIXED TAX RATE of 19 cents per gallon to tax rates that would CHANGE ANNUALLY. Using the formula in the bill, would mean the initial tax rate for gasoline beginning October 1, 2015 would be 41.7 cents per gallon, and 46.4 cents per gallon for diesel motor fuel. Another, (HB 4630) would amend Section 801 of the Michigan Vehicle Code which would ELIMINATE the “depreciation” of tax rates for passenger cars, vans, and light trucks, and create a new tax registration surcharge for electric-powered motor vehicles. Instead of registration fees decreasing yearly, they will always be at their high level. (SB 847) would amend the Income Tax Act and would increase the amount of the homestead property tax credit for seniors and the disabled, but drastically reduce the number of people able to qualify for it because their income must fall between $3,001 and $6,000. There are more bills in this proposed amendment than I have space to mention, but I’m convinced that there are too many hidden fee increases and taxes that are not explained to us. The money supposedly raised is not even TOTALLY earmarked for the repair of our roads as we are led to believe the major part of the tax increase is for. Thank you Mr. Groundhog…you saw your shadow, so now we are in for 6 more weeks of Winter, guess you know that takes us to around March 17th, St. Patrick’s Day. We will be back on Daylight Savings Time, as of the 8th of March and if we get another snow storm, we may be shoveling snow in the dark! Thanks! …..as a footnote, I thought of including a recipe for “Groundhog Soup” and maybe we wouldn’t have the same result next year. I hope you were treated well on St. Valentine’s Day or treated your special Valentine well. The Valentine’s Day tradition started hundreds of years ago and is one of the most highly celebrated Holidays’ of the year; you believe that if you went out for dinner in the evening! You will hear more about this in the coming months, but we are going to try a different procedure for this year’s picnic; there will be no charge for tickets, you must have a ticket to attend the picnic, you must sign up and get your ticket, there will be a deadline for getting signed up and getting your ticket. We want to try this procedure this year to still get an accurate head count without having to collect and return the $5.00 we normally require. This will be a trial run to see if the system will work for us…Stay tuned. Here we go... charging into 2015, with our resolutions in hand, full of energy and high goals to reach. Maybe it's losing weight, eating healthier, walking or working out regularly. Possibly spending more valuable time with family, or friends we haven't seen in years. My update on the House of Representatives action on their first day shows that they apparently are going to try to gut Social Security Disability Benefits, which will lead to putting Social Security as we know it in danger also. They did this by simply approving a rule preventing the reallocation of Social Security funds to men and women who receive Social Security Disability, unless that reallocation is accompanied by either benefit cuts or tax increases. I'm thinking they will not be raising taxes to cover this, so we may be looking at benefit cuts in Social Security Disability benefits the next two years, as much as 20%. This reallocation process has been a normal thing in past years, and only done eleven times since 1968. It sounds to me like they are declaring war on middle-class Americans to help fund more tax cuts for the 1%, which will also bolster their arguement for the privatization of Social Security. Once again, I'd like to stress, just because we may not have the Democrat we had hoped and worked to get elected, in office, we do have representation, and we need to give that person all the feedback we can to make sure our feelings about legislation being considered are heard. DEMOCRAT OR REPUBLICAN. Remember the Union Label sponsored Pancake Breakfast, Sunday, February 1, from 8 am - 12 noon. White Shirt Day Celebration will be held at 651 on February 11 at 10 am. Whatever your resolutions are, may your energy keep up with your ambitions. What a wonderful time of the year we are in right now. People are in a giving and charitable mood. We see all around us the lights of Christmas, decorated homes, stores and churches with nativity scenes, preparing for the celebration of the birth of the Christ child. Santa helpers are everywhere you look, a tradition brought to us many, many, years ago promoting giving of gifts, and good will to others. So as you stand in a long check-out line, while the other lines move faster than yours, and then the person ahead of you has a problem with their credit/debit card or has to show more identification to use a check... SMILE... Tis the season to be jolly! As you read this, our Christmas dinners are over. I hope you were able to meet and visit with friends not seen for a while. The Executive Board wishes you all a Merry Christmas and Happy New Year! My hunting trip to the U.P. was great, even though we didn't bring back any venison. There was 3 feet of snow in the woods, and the deer weren't moving around as much as we'd liked to have seen. It was very cold and hard to sit still for any length of time. We are in the planning stages of some trips and events for 2015. We hope you will take advantage of some of them. Remember Bingo on the first Tuesday and our Chapter meeting on the third Tuesday of every month. Refreshments will be served at both. There is much to think about this next year, with getting our dental and eye care coverage back through the VEBA trust. Whether you should cancel your COBRA coverage or not is something to think long and hard about. Every case is different, so don't cancel it just because someone else tells you they don't need or want both. Now you have it. No more daylight saving time, it’s dark later in the morning and dark earlier in the evening. Sometimes I wish we’d leave well enough alone, and take daylight and dark when they come naturally. I love the Fall Season of the year, when the leaves have fallen and gone, either by raking and bagging, mulching or just blowing into the neighbor’s yard. I love an annual deer hunting trip to the U.P., a fresh snowfall in the woods, a hot cup of coffee on a crispy cold night while gazing up at a clear sky full of stars. When you’re in the middle of the woods, with no streetlights, stoplights, or headlights, it’s REALLY DARK and stars seem so bright. You may have heard the saying; “Silence is Deafening” That is what it’s like. The silence is broken only by the occasional call of a coyote. With Thanksgiving this month, let’s remember to be thankful for the little things as well as the big things we have, such as health, good friends, and many of the benefits we enjoy just living in the United States of America. The mid-term elections are over, and the ads are off TV. We did not un-seat the Governor, nor did we take control of the legislature. This is no time to give up, nor to think things are hopeless. We must continue to be just as active in the political process as we have been in the past. In fact we need to be more informed on what is going on in Lansing and Washington and be vigilant about contacting our Representatives and Senators, regardless of what side of the aisle they occupy and make our desires known. Remember again, what Thomas Jefferson said “We in America do not have government by the majority. We have government by the majority who participate.” WE must be the majority who participate! We see the UAW wheel almost everywhere around us, so think for a moment what it represents. Within that wheel, there is protection of women's right to equal opportunity for equal paying jobs, workers' rights to safer workplaces and safe work practices, equal opportunity employment and better paying jobs, just to mention a few things. As you well know by now, our current governor and the Republican controlled legislature are on the path of puncturing and trying to destroy this wheel, with their anti-worker and anti-middle-class policies. I know you've heard the words, "This is the most important election of your life." I truly believe, in this election, we have our backs against the wall, and there is a firing squad of Republicans waiting to see if they will have another chance to put through more of their agenda, which is aimed at destroying the middle class, working families and the unions that are working to protect the basic programs we have enjoyed in the past. Thomas Jefferson said, "We in America do not have government by the majority. We have government by the majority who participate." There are many statistics out showing how many good UAW members, both active and retired, either did not vote last election, or when they did vote, voted in support of the same "firing squad" that is now lined up against us. On Tuesday, November 4, 2014 you have the responsibility and duty to vote, and become part of the "majority who participate." If you have already voted by absentee ballot, use the day to help your family, friends and neighbors to vote. The importance of voting in this election cannot be stressed enough! Well, summer is officially over. Raking and disposing of leaves is beginning. Whether you rake and bag, rake and burn, or just mulch them up with your mower, it's a necessary chore if you or your neighbor has trees. Personally, I do not like the smell of burning leaves, so I mulch mine up with the mower and let nature do the rest. Have you ever cornered an animal, or seen a cornered animal that will not defend themselves by putting up the biggest and best defense they can? It may be growling, barking, snarling, baring their teeth, making themselves seem bigger, meaner, or whatever they can do to ward off the danger they feel. We are in a corner this election cycle, and need to spend some of our valuable "face-to-face" time expressing to whomever we can, the need to vote, and vote responsibly this November! Our country is suffering the consequences of a do-nothing Congress whose objective WAS to make sure the President was not re-elected for a second term. Now, their objective must be to slow the working of legislative programs so nothing gets done that might help the middle and working class of Americans. We need to help the President by electing representatives and Senators who will work together, and for the common good of all Americans, not just the wealthy CEO's and Big Corporations, who can afford the lobbyists to do the bidding for their favors. The State of Michigan needs a new Governor, with control of the House and Senate, to turn the state around. The things we've seen happen to us the last two years are going to get much worse if we do not elect the people needed to stem the tide of anti-worker, anti-senior, and anti-young family legislation we have been bombarded with. The Republicans passed legislation to quiet a petition-driven referendum that would help the working class, and young workers of our state. This was done to keep us from voting on it in November. In my mind, they are taking away our right to vote, and passing a watered down version of the petition drive. I'm referring to the minimum wage issues. Remember, at our business meeting October 21, members of the VEBA Trust and representatives from our various health organizations will be present to inform us about the changes coming in January 2015. With the primary election over, we should see a decrease in the repetitive political ads. Although, I am confident this is a temporary reprieve, so enjoy it. The Dog Days of summer are upon us and most vacations are either over or soon to be over, and I hope you were able to make some good memories, as I did. My son, Rob, was married in June to Nichole and I volunteered as a guide for blind participants the last week of July in Deposit, NY where one of the blind participants waterskied around the lake of about 3 miles, just to name a two. Recently, being in a small restaurant, I looked around and noticed many, many people sitting in booths or at tables waiting for their order... staring down at a cell phone, or tablet, texting or reading a text, or maybe checking their Facebook page. Some were eating and had their phone, or tablet on the next to their plate, keeping up with whatever. I suppose talking to people face to face is losing ground to technology. We will be considering the matter of replacing delegates to 1-D Regional Retiree Workers Council at our business meeting in September. Some vacancies have occurred due to retirement and resignations. We will be discussing this briefly at the Bingo September 2nd, and again at the business meeting September 16th. There should also be information coming about the VEBA Trust Dental and Vision benefits that are scheduled to be offered again in January 2015. We will get the people who have good information about the plans and choices available as soon as possible. Our dog "Gizmo," a Yorkshire Terrier, weighs all of 3 lbs 5 ounces and will charge, barking loudly like he's going to EAT someone or something... like another dog, or whatever, no matter what size, that is walking, with his owner down the street or just in their own yard. If the dog turns toward him, he will run away yelping like he's been "bitten." He also will shiver and seek shelter when he hears loud sharp bangs, like fireworks, and can seemingly hear thunder before we even know it's in the area. He is a great pet and loyal friend, along with our other dog "Mitsy." "Gizmo" reminds me of some people... They are all about blasting our elected leaders, and the people they have appointed to positions of authority. They verbally try to destroy reputations or policies enacted by these representatives, senators, judges, appointed people, and the like. They always have something to say about how they don't like this or that, but will "like" various commentaries they see on "Facebook" that tear down policies and decisions made by the elected, and appointed officials, many of which cannot be verified and are actually twisted half-truths or outright lies. When these people are confronted with the truth, and engaged in real dialogue that will untwist the half-truths, they will often change the subject or try to give some other goofy reason to support what they've read or heard. You and I need to keep ourselves informed on the truth of issues so we can answer these people when the untruths and shaded lies come up in conversation. As you vote in the upcoming Primary elections, keep the truth in your thoughts. Spend time this summer enjoying grandchildren, your friends and family. We have no guarantee of tomorrow. Just having attended the 36th Constitutional Convention, we saw; membership dues increase of 1/2 hour per month for the active workers, which will be dedicated to building up the strike/defense fund; a newly elected UAW President, Dennis Williams; our Regional Director, Norwood Jewell, elected as a Vice-President; and our Region 1-C combined with Region 1-D, which creates a much larger Region 1-D under the leadership of Director Gerald Kariem. There was also a vote to change the constitution for an increase of retiree dues from two (2) dollars to three (3) dollars. This increase will be voluntary for those of us already retired and paying dues. This fall is bringing some great challenges with the elections of our representatives and senators, both statewide and federal. Do not forget the past two years of misguided and hurtful legislation we have been bombarded with. We must elect those who will lend their ears to us, the working class, rather than the lobbyists, and big business that seemingly they are working for at this time. There is an all-out attack on working-class people and the working way of life focusing on organized labor. We need to speak out with our vote as never before. The UAW-endorsed candidates will work for us and support legislation that will help build a strong middle class of working people. These candidates must actively seek the endorsement of the CAP Council and then are interviewed by CAP Committee before being endorsed. Watch the Searchlight for them and do not be afraid to contact candidates and question them on their views and goals so you don't have further doubt. Your Executive Board hopes you have a great summer. Be safe and we'll see you soon. Elections are over and you have new leadership for the Chapter and I am certain they will do a good job. According to Governor Snyder, he is the come-back kid. Let's look at how he got there.... by getting control of the House and Senate. He, along with the rest of his cohorts, has no conscience as to what they are doing to the working-class families and retirees. After making the statement that he wanted to improve employment and education, have we seen any improvement in either one? To education, he has made cuts to how much the state gets for each student. He took away most of the Homestead Tax deduction. He took away the $600 deduction for each child dependent on the State income tax. He put a tax on retiree pensions. He said Right To Work was not on his agenda, but as soon as it got to his desk, he signed it. So come November... let us not forget what this Governor has done to the working class and retirees, and vote the NERD OUT! On a final note, Annie and I would like to thank you for all your support over the past years. We have met a lot of very nice people and made some very good friendships. We will miss you, but we won't forget you and we will be checking in on you from time to time. Watch the Searchlight for upcoming events. By now you all know that the elections of Officers will be held on April 3, 2014. I want to let all the members know that I will not seek re-election. I made a promise to my wife and myself that I would not be a "hang me on Chairman." When I found that I could not do the job anymore, I would step down. I want to thank the membership for all their support over the years and I know that you will support the new Chairman and Executive Board. I know that they will work hard together to achieve a better life for the retirees and to keep you well informed in all that relates to Retirees. I am proud of the things that our Chapter has done to improve the Hall; like helping with the cost of repairing the parking lot, the new roof, painting of the hall, putting the picnic tables together so all members active and retired could enjoy the pavilion, and helping with the cost of the mailing of the Searchlight. None of these things could have been done without the help of the Executive Board and the Retired Members which passed these expenditures without question. They knew it was for the good of the hall and all members active and retired. I have put this in this article because some in-plant leadership and active members have made the statement that retirees are greedy and only think of themselves. I want to let it be known that most retirees are glad for the active members; that they receive bonuses and incentives for the hard work that they do and I hope that continues. Let's hope life improves for all members in the following years. I get so angry when I hear Governor Snyder brag about the state's surplus of $971 million. This surplus was accumulated by stealing money from the school aid fund, from taxing Retiree pensions and by taking away the tax credit for dependent children, which was six hundred dollars per dependent. Now, because this is an election year, he wants to give a tax cut so it will make him look good. If he wants to do something for the people of Michigan, he should give that surplus of $971 million back to the school aid fund (which the schools desperately need), eliminate the pension tax of the Retirees and never mind giving small businesses a tax break. I think this would be a step in the right direction! Snyder said that making Michigan a right-to-work state would improve unemployment. Michigan is the third highest state for unemployment in the nation. Hey Snyder... Where are the jobs?? The real agenda behind the right-to-work law is to break the unions, so employers can run roughshod over employees. Also, with this law employers can be lax about working conditions and the workers have no resource to turn to for help in this area. Another thing Gov. Snyder and the Republicans can do is... reinstate the extension of the unemployment benefits so these hard-working people have more time to look for a job. It is not an easy task to find a job in Michigan because of all the lost jobs our state has endured. I see a bigger gap between the rich and poor of Michigan. It is time that Snyder governs ALL the people in Michigan and not just take care of his rich friends. I hope everyone had a good Christmas, my wife and I had a great one. Our son, wife and grandson from North Carolina come in and surprised us. We had most of the family together at our house because of the power outage, only 25 of them. We had a great time talking about their younger years and looking at old pictures, laughing, crying, and playing games. All the grandkids said this is how they remember Christmases past, everyone at Granny and Grandpa's house, celebrating and enjoying each other. So my wife and I made a pledge that we would host it at our house as long as we can wobble around. That we eliminate Express Scripts so we can take our prescriptions to a local drug store or pharmacy, which is so much easier and we can talk to a real person face to face if we need to, instead of being dictated to where we can get them. On a sad note.... we lost our Chapter Chaplain, Chris Luft. He will be missed by all of us. Chris was a man's man and cared about everyone. When he gave you his word, you knew it was gospel. He is now with his dear wife Sally and probably calling Bingo in Heaven. We just had our Thanksgiving dinners and everything went smooth and everybody seemed to have a great time. My wife and I want to wish you all a Merry Christmas and a Happy New Year. Let's hope this new year will be a good year for everyone. I want to talk about the Affordable Health Care Act. Yes, there are some problems in the program, but remember when Social Security and Medicare started out they had problems too. But the government worked together and worked them out... they are good for all retirees today. This is the first time a President has gotten the bill through the House and Senate and it is the law of the land. Now it is time for the politicians to roll up their sleeves and make this Affordable Health Care Act workable for all the people. They can do it just like before with Social Security and Medicare acts. President Obama made a mistake on the Affordable Health Care Act and has apologized to the American people that he was wrong and that he would correct the problem. What more do they want? Blood? As far as I am concerned, the President does not have to apologize for trying to do the right thing. I hope he continues to keep up the fight with the politicians who seem to want to block his every plan. At least he has a plan! Please watch the Searchlight for upcoming events. In my last article, I asked all members and spouses to come to the Chapter meeting to get firsthand information on the VEBA Trust. Boy, oh boy did you ever respond. We had an overflow crowd. The representatives from the VEBA Trust did a good job. I have scheduled another meeting on November 19th, so if you could not attend the first meeting or could not get into the hall, please come to this meeting. We will have all insurance carriers there so you can have all your questions answered. Remember the meeting starts at 10:30 am. It would be nice to have another overflow crowd. We are trying to make sure that our members are well informed on all the changes in our benefits. How about this latest fiasco of the government shut down. The ones responsible is the Tea Party. Their goal is to stop Obamacare. They are using extortion to try and accomplish this goal. The leader of the pack is Sen. Ted Cruz from Texas. He would have you believe that they can roll back our amended Obamacare. This law has been in place for a year! Because of him and the Tea Party, it has cost the American economy $24 billion. I would like to send the Republicans and their spoiled kids (Tea Party) to the little children's table and drink their tea and stay out of the government. 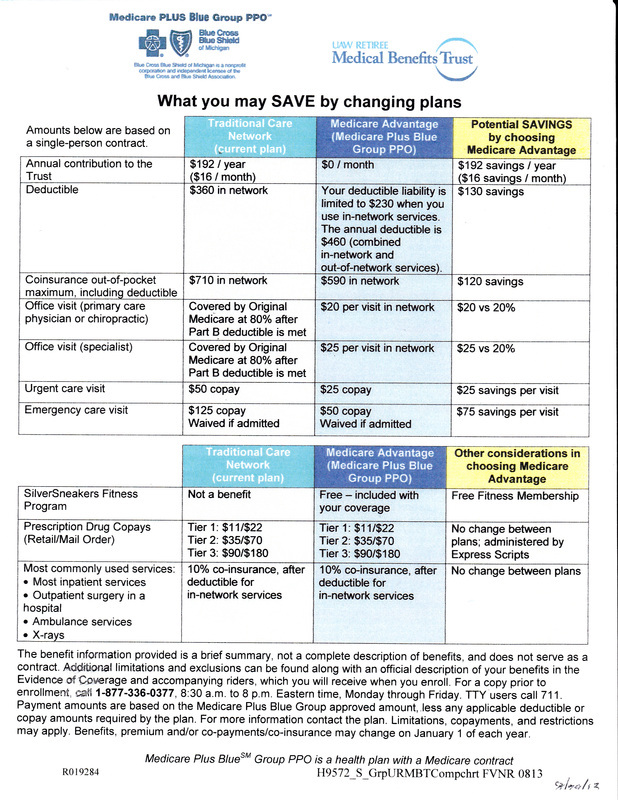 I suppose all of the Retirees received the new plan option from Blue Cross Insurance in the mail recently. They claim you will be able to save money with this plan. To be able to understand this new plan we will be having a meeting at the hall on October 15th, at 10:30 a.m. hopefully all your questions will be answered but still take a few days to think it over before you change anything, even going over to the hall and talking to a Benefit Rep. before you make a decision. Please attend this meeting! It is for your benefit for you to make the right decision for your health care. I would like to make a challenge to all members who attend the Chapter meetings on a regular base, to bring a new member with them so as they can see what we do and how we inform members of important subjects that might impact their lives. We had a good turnout for the Annual Picnic and it was perfect weather wise. Everyone seemed to have a good time. 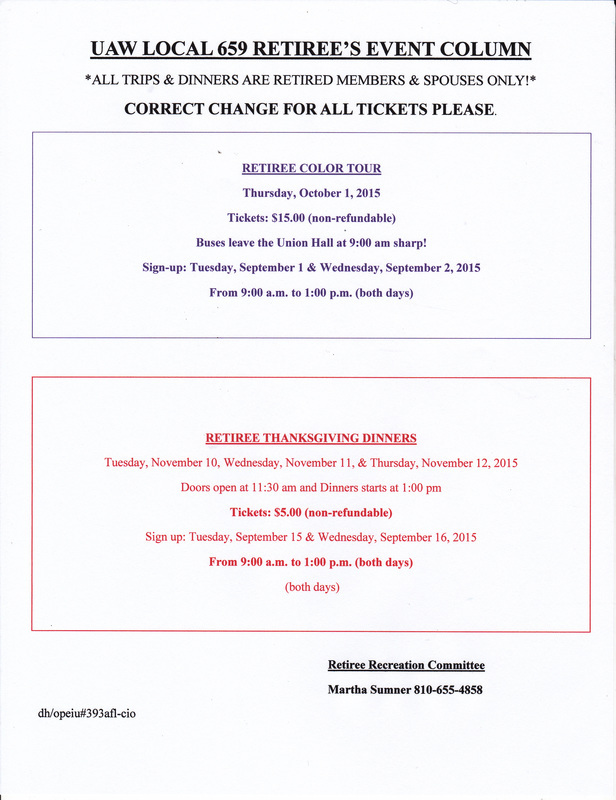 The next event will be the Color Tour on Thursday, October 3rd, buses will leave at 9:00 am sharp!! Please be on time. Please watch the Searchlight for the sign-up dates and days of the dinners. If you like weather that acts like a yoyo, then you have been enjoying the weather these past few weeks. You don't know from one day to the next if it is going to be hot or cold. Let's hope August will be a more enjoyable month before we get down to the business of facing the fall and winter months. I hope more retirees come to Chapter Meetings so they can become more informed on what is going on that can affect the Retirees. For example... any Retiree under 67 years of age will now have to pay a pension tax. They have done away with most of the homestead tax and right now Gov. Snyder is pushing for a tax on gas of 8 to 15 cents a gallon. He has not gotten all of the votes needed for this to pass. The biggest boondoggle that the nerd wants is to put a cap on no-fault insurance. All these things will cost the Retirees more money. They should leave the no-fault insurance alone, as we have one of the best in the country. Since taking control in 2011 the Republicans have imposed deep cuts in local schools to the amount of 2 billion dollars. Now we are seeing the affect .... bigger class sizes, shortage of supplies and computers and failing school districts (for example, Buena Vista). The Republican shortsighted policies have passed billions in tax give-aways to big corporations and paid for them by increasing taxes on residents and forcing seniors to pay the new tax on retirement income. The Republicans claim these will create jobs! What? I would like them to show me the new jobs that are being created. But I think they are having a figment of their imagination. What say you??? We all had a nice time at the ballgame in July and are looking forward to the picnic. Remember: no Chapter meetings until September meetings start at 10:30 am. 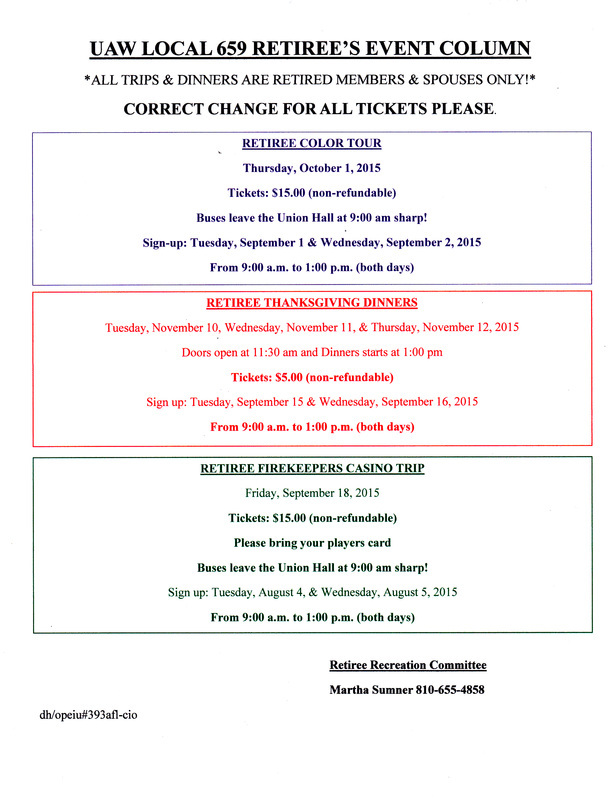 A reminder for the casino trip set for September 18th, buses leave the Union hall at 11:00 am SHARP. Park in the back of the lot by the ball field. Read the Searchlight for upcoming events. Thanks to Obama-Care, Medicaid has become the right of all low-income families. In Michigan it will give the low income families a chance for health care for the first time. It gives them access for affordable rates and gives quality health care for their families. This will improve the lives of tens of thousands of families in our state and rein in high health care cost for hospitals and physicians and reduce the tab for taxpayers. That means more than 620,000 Michiganders could finally get access to health care with no cost to taxpayers through the year 2020 and little cost beyond that. On a personal note, Annie and I want to thank everyone for their prayers, love and support during our recent time of grief. Our son meant a lot to us and there is going to be a big hole in our hearts and in our family. I would hope that everyone would take the time to tell your loved ones that you love them and that you are proud of them, because you never know when that day might be the last time you see them to talk to them. Life really is so short. Read the Searchlight for up-coming events. Writing this article is very hard for me to do this month. Annie and I lost our oldest son, Scott McCann. He was only 56 years old. It was very sudden and such a shock, but with the help of family, friends and God we will get by. I hope Mother Nature has gotten all of the could weather out of her system and we will continue to have great weather for the rest of the summer. After all, we retirees have graduations, open houses, and weddings to go to and we want good weather for them. Us, as grandparents, can reflect back on our grandchildren when they were just babies and now they are young adults and how proud we are of them. We hope all their dreams come true and that they enjoy life without to many worries and cares. Lobbyist and Republicans are working on re-doing the no-fault car insurance compensation by setting a cap on your no fault and telling you that your rates will be lower. Don't believe this. You know as well as I do, that the insurance companies will find a way to make you pay more or at least what you pay now. Left as it is, we have one of the best no-fault coverage in the United States because it has unlimited coverage on all accidents. My finale word to Lobbyist and Republican Politicians, leave our no-fault alone!!! Hey, wake up Governor Snyder! What do you mean when you say fairness in taxes? Let's look at his fairness... one of his first moves was to tax Retirees pensions for the ones under 67 years of age. Second, he increased the registration fees on vehicles. Third, he wants to raise the gas tax so he can use the money to pay for road repairs and the new bridge from Detroit to Canada, even though the legislators voted against it. I would like to inform him that Retirees buy 25% of new cars in Michigan and the gas tax is high enough. Fourth, he wants to change Medicare and I bet it will mean higher costs for the retirees. Fifth, he has attacked the Unions with the right-to-work law, claiming this will increase jobs. You and I know this will not happen! Instead, it will take us back to the 1920s and 30s. It takes away all that the Sit-Downers won for us. Remember, they worked for whatever wages the company wanted to pay and they would fire you at the drop of a hat, for no reason and without any kind of representation. He is bleeding us dry! So wake up Snyder and see what havoc you are causing the average working man and all retirees. Remember, during the summer recess there will not be any chapter meetings or bingo in July and August. Look in the Searchlight for upcoming events. Governor Rick Snyder is at it again, telling the people of Michigan that the job growth is better because they added 2,700 new jobs, more than in any other month in the past year. What he didn't tell you was that they were seasonal jobs! Snyder, let's tell the truth, those jobs were added because of the Christmas season and most of them are back on the unemployment line. The ones who were so called lucky to still be working are working only part-time for low wages. Some even have to work two and sometimes three jobs so they can support their families. They have no health benefits or extra cash to put into a 401K Retirement Fund. Snyder said that the right-to-work law would make a better atmosphere for job growth. What he didn't tell you is that you would work for lower wages. Michigan is already ranked 36th per capita income. Our unemployment in Genesee County will not get any better because General Motors is going to more and more automation and this replaces employees. Also, we cannot compete with the unfair trade agreements make with China, Mexico, and South Korea. Our government has to step up to the plate and make these trade agreements FAIR so we can add jobs, not lose them. The right-to-work law has to go and the trade agreements must be fair! I am relinquishing my article to print information that I received in the mail from Region 1-C. I am sure you will find it interesting. I just raised your taxes! You’re in for a shock when you prepare your taxes before the April 15th deadline this year. A lot off the deductions that you l used to get are gone, thanks to Governor Snyder and the Republican legislators who supported his tax plan and many seniors citizens will have to pay tax on their pensions for the first time. Snyder’s tax hike was a huge tax shift that raised individual taxes by $1.2 billion to pay for a $1.4 billion tax cut for business owners. Here are some of the tax hikes and deductions you can no longer claim. Your Children- you used to be able to deduct $600 for each of your children under 18. Not anymore. That will cost Michigan taxpayers $57 million. Senior Citizens and Unemployed- A $2,300 exemption for persons 65 and older and workers whose unemployment compensation exceeds half of their adjusted gross income is eliminated. That’s a $41 million tax hike for seniors and the unemployed. Homestead Property Taxes- the Homestead Property Tax Credit will be cut for about 400,000 families, costing taxpayers $270 million. Earned Income Tax Credit- the EITC will be lowered from 20 % to 6%, a $261 million tax hike for low income working families…. an average tax hike of $307 for those who can least afford it. Charitable Contributions- a number of tax credits have been eliminated, including credits for charitable contributions, city income taxes, college tuition, adoption expenses and still born children. This tax hike will cost Michigan taxpayers $104 million. Pension Taxes- Retirees will pay more than $340 million in new taxes. THE DAY OF THE CASINO TRIP IS THURSDAY NOT WEDNESDAY!!! IT WAS WRONG IN THE SEARCHLIGHT FOR FEBRUARY!!! The Master Mechanics of the Flint Metal Center meet for breakfast at the Capital Coney Island Restaurant on Bristol and Van Slyke Rd, every 3rd Thursday of the month at 9 AM. V-8 Engine Retirees meet for breakfast at Valley Coney Island at 8 AM on the last Wednesday of every month. 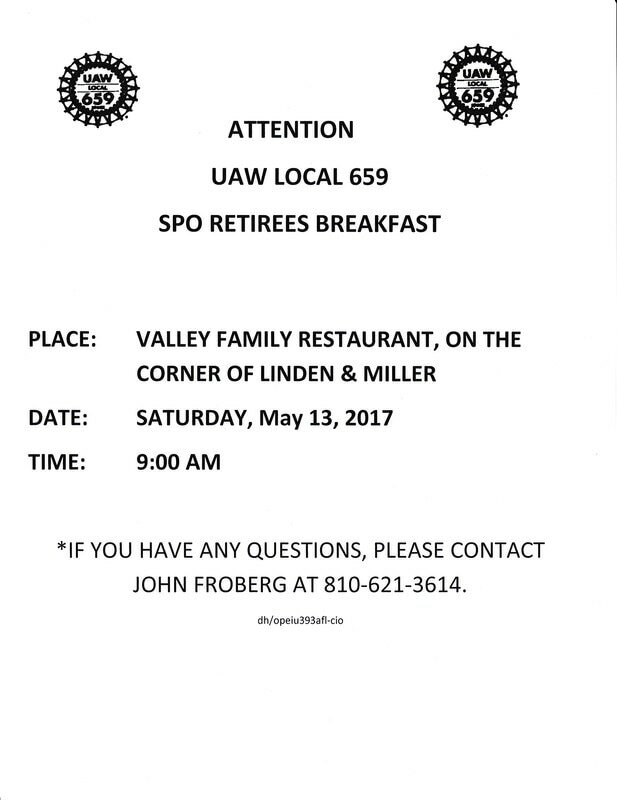 V-8 Engine Material Department - Retirees and Retired Fork Truck Drivers meet for breakfast at Valley Coney Island, 9 AM on the second Monday of the month. 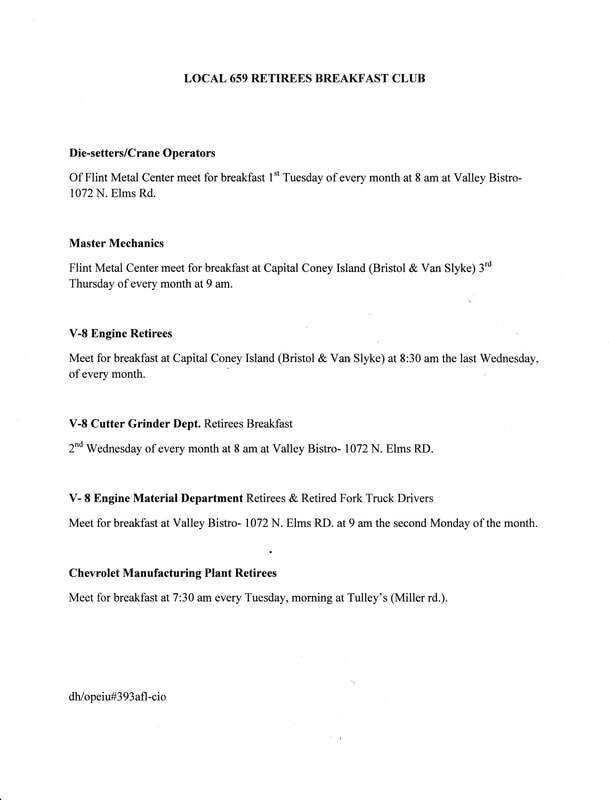 Diesetters/Crane Operators - Flint Metal Center meet for breakfast the first Wednesday of the month at 8 AM at Valley Coney Island.